You'll need to take the necessary precautions — remember, you are looking at the sun! 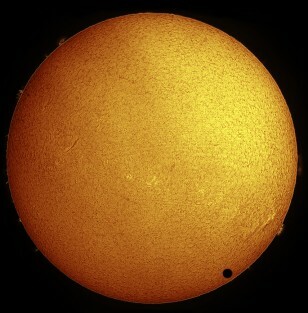 Paul Hyndman captured this stunning view of Venus crossing the face of the sun in hydrogen-alpha light on the morning of June 8, 2004 from Roxbury, Conn. He used an Astro-Physics 105-millimeter Traveler telescope fitted with a Coronado Solarmax90/T-Max and 30-mm blocking filter, a TeleVue 2X Powermate lens, and an SBIG STL-11000M CCD camera.